Baton Rouge, LA – September 16, 2014 – Lamar Advertising Company (Nasdaq: LAMR) and Vondran Orthodontics are responsible for bringing the first 3D billboard to life in West Little Rock, Arkansas. The innovative billboard design features a row of 3D teeth and braces with reflectors to increase visibility during the day. At night, LED lights positioned behind the teeth glow, making the billboard fully visible at all times. The Vondran Orthodontics campaign concept was developed by Marketing Consultant and Account Executive Jack Lankford of Lamar Advertising in Little Rock. Artist Jon Collins of Lamar Advertising executed the design and added embellishments to the concept to make the billboard stand out. “I have been designing billboards for Lamar’s customers for 29 years, and this is one of my favorite designs as of late,” said Lamar Advertising Artist Jon Collins. “This is one of those creative pieces that really showcases Lamar's capabilities from a production standpoint." The Vondran Orthodonitcs billboard features larger-than-life 3D teeth with reflective braces extending off Lamar Advertising’s billboard space in West Little Rock. At night, LED lights positioned behind the teeth glow, making the billboard fully visible at all times. Lamar Advertising started producing custom 3D objects at its printing facility in Baton Rouge last year, and Vondran Orthodontics took advantage of this opportunity for their new campaign concept. “It has been fantastic seeing the idea come to life,” said Dr. Andy Vondran. “The response to the billboard has exceeded all my expectations, and positive comments are coming into my office left and right. I can't wait to see the long-term results on my practice." The 3D billboard stands on Rodney Parham Road in Little Rock, Arkansas. Lamar Advertising Company (Nasdaq: LAMR) will release its third quarter ended September 30, 2014 earnings report before the market opens Wednesday, November 5, 2014. 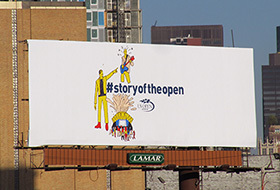 Lamar Advertising Company (Nasdaq: LAMR) is bringing the essence of the U.S. Open to life on a New York City billboard in a unique, artistic way. Each morning of the U.S. Open, artist Josh Cochran hand paints a new addition to the mural, revealing the "Story of the Open" on a billboard standing above the Midtown Tunnel.